I’ve known Rich Chou since he was an All-Island stud at St. John’s, being named league MVP in both basketball and volleyball in 1997. In fact, he was on the last Knights basketball championship in 1995 up to this year’s title team before heading to Pepperdine for college. It’s well documented that his love for mixed martial arts took him through Elite XC, ProElite, Strikeforce and now as the Vice President of Talent Relations/Matchmaking for Bellator. Rich has always offered me to attend one of his events IF I was ever able to make it. Well, I finally got a chance last month in San Jose’s Bellator 199. Under one condition: if Rich had a spare bed for me to crash on. The trip was booked. I flew in just in time for the weigh-ins on one of the corridors of the SAP Center (home of the San Jose Sharks). The Bellator team was nice enough to seat me right up front for the staredown of the main event guys Ryan Bader, King Mo, Jon Fitch, Paul Daley and the others. Even got to spend some time with Guam friend Royce Gracie, who had always asked for a Guam flag since his last two visits. Request granted. While Rich was doing the night-before-the-event meetings, I spent some time with his lovely family – especially 3-year-old Ollie, who fondly called me ‘Uncle Patch’. Bellator V.P. of Talent/Matchmaker Rich Chou behind the scenes of Bellator 199 recently in San Jose. On fight day, we drove in to downtown San Jose (less than 30 minutes from his home) for the fighters’ check-ins. We spoke about the travel associated with the business, the vision and the drive of Bellator President Scott Coker and how Coker works out of coffee shops around San Jose, the evolution of the sport and the current and future Guam fighters. Most of the work leading up to this has been done already…just making sure the fighters and their corners know what time their fights were scheduled and what time they should be in the lobby to catch the shuttle to the arena. Fellow Bellator executive Mike Kogan and a host of company teammates were making sure things ran smoothly throughout the morning. A stop in the lobby Starbucks and a quick talk with an avid Bellator fan who asked Rich if he’s going to set up a 50 Cent/Rampage fight before we were back at the Chou home to get ready for a long afternoon and night of fights (14 in all). It was a homecoming of sorts for Rich since most of the fights are in other parts of the country or the world, so to have an event in his hometown where he can spend with his young family was a pleasant change to the travelling routine. Rich Chou and 49ers quarterback Jimmy Garoppolo at Bellator 199. With the fights starting at 4 pm local, Rich had to get to the arena by 2 pm to make sure the massive production goes as planned, making for a long day that would end past 11 pm when all the fights were done. After Ryan Bader knocked out King Mo in the main event in a matter of seconds, the local circuit fighters entertained the die-hard fans with some great action. 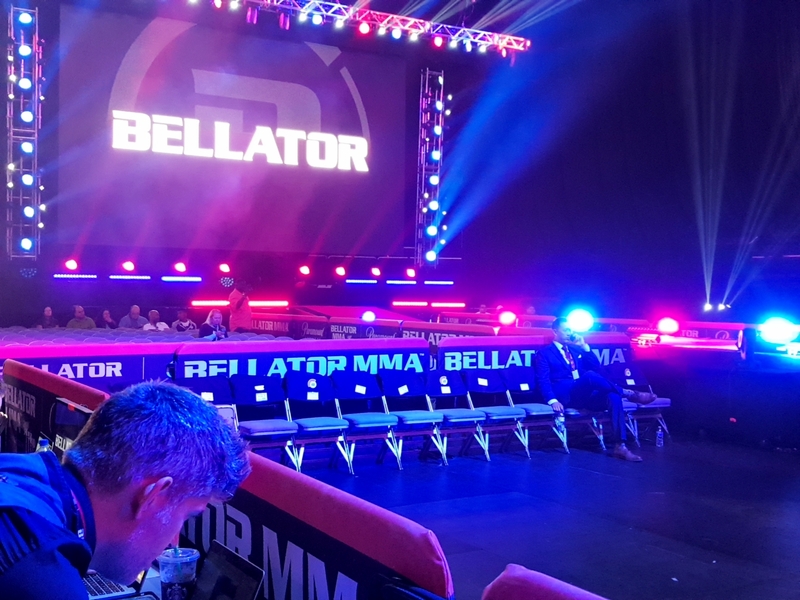 As the final bout concluded, Rich stuck around to make sure the breakdown crew was in place before moving on to Bellator 200 in London. But there was one more stop. He’s driving, I thought. I can’t say no. Heading into the downtown area almost midnight, we jump out of his big Ram truck and head into a snazzy restaurant that is now doing after-hours. There was Jay Glazier and Josh Thompson at the bar. “This is my friend Pat,” Rich introduces them to me. Then I followed Rich and Jay further back to where the new Golden Arm of San Francisco stood: Jimmy Garrapolo. As a life-long 49er fan, it was surely surreal. Rich introduced me to Jimmy and then disappeared. As cool as he seems on TV, Jimmy G (dressed in casual jeans and white t-shirt) looked every bit the calm quarterback he’s known for. Whether or not it does remains to be seen. Thanks for the memories Rich!